In 2018, we launched PRISM Prospect, our predictive data model based on analysis of hundreds of thousands of businesses over 25 years. PRISM Prospect identifies businesses likely to have a funding need over the next 12 months. The model segments UK SMEs into five propensity categories from very likely to unlikely. According to the model, those businesses in the highest propensity category are more than four times as likely to have a funding need compared to the national average. As with all predictive models, the drivers of behaviour in the past may not stand the test of time. To that end, over the past few weeks we have been analysing secured debt facilities taken out in 2018 and reconciling with the predictions we made. The initial analysis is very encouraging and goes some way to validate our propensity model, As the table shows, 20% of companies we suggested would be more likely to borrow took out new secured debt in 2018. 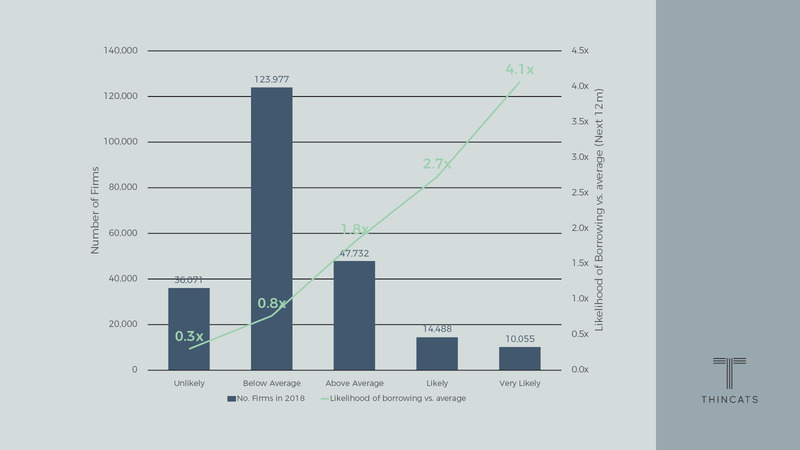 It’s worth noting that our analysis does not include unsecured debt (roughly half of all business loans) and so the percentages are likely to be higher still. This information will be available when companies file their 2018 accounts. The team will continue to employ new techniques and work with partners to further enhance the precision of PRISM Prospect. We are pleased to announce that we had a record year for lending in 2018, more than doubling our 2017 figures to £112 million. In total we have lent more than £350 million to UK SMEs. Data science and analytics is embedded deep within ThinCats’ business principles. It is the company’s aim, to develop some of the industry's most predictive models; to identify and fund the underserved companies that ultimately drive our economy. Amid current fascination with driverless cars, it’s worth considering how far we are from a driverless credit process, as it were – what do algorithms and AI have to offer, and what still requires human consideration?